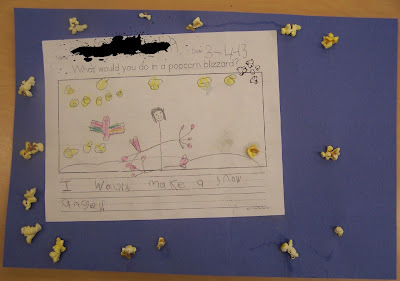 Ok, so it's not really a blizzard, especially here in sunny Southern California, but we did read a tall tale called "Paul Bunyan and the Popcorn Blizzard!" It tells the story of Paul and how he grew to the size of a 10 year old in just one short month! The tale also tells how Paul heard the sound of a baby animal crying in a snowdrift, so he dug in the snow and discovered an ox that had turned blue from the cold! Paul named him Babe and they became best friends. And during one particularly hot summer, the ears of corn got so hot that the corn began to POP, right off the plant. The popcorn began falling all over and the lumberjacks were fooled into thinking that it was a blizzard. 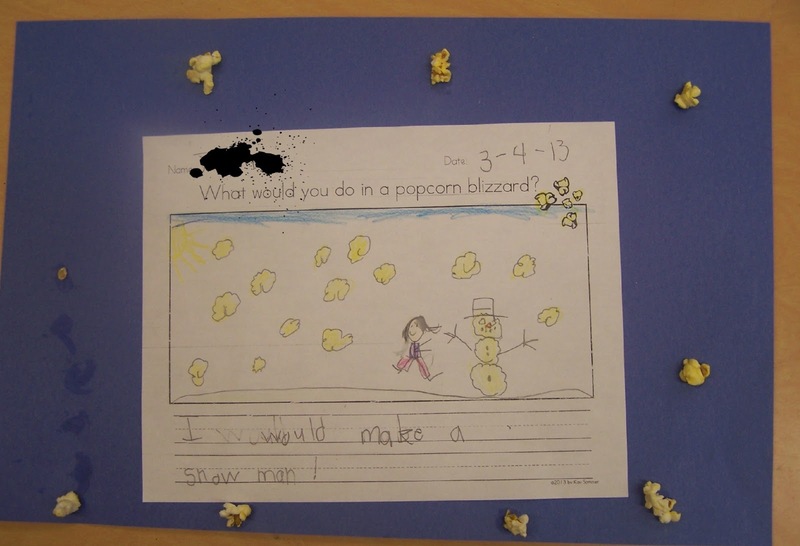 They put on their coats, scarves, and mittens and played in the snow - I mean popcorn! 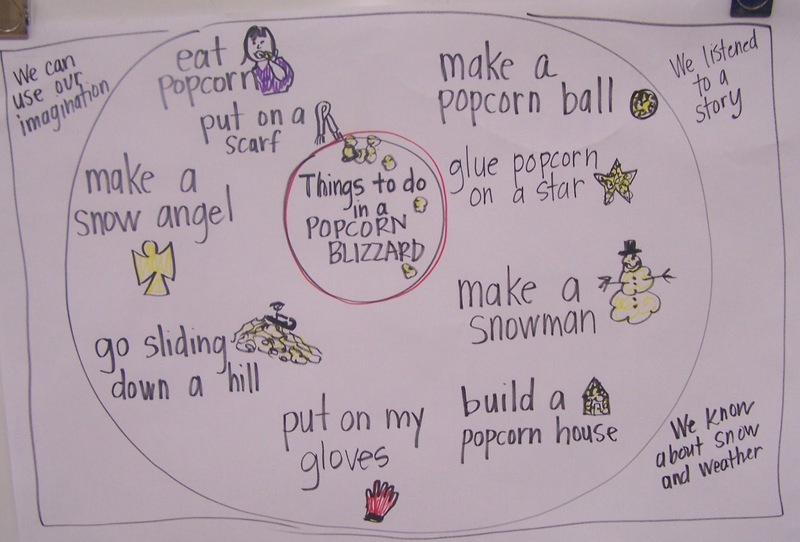 To begin our writing activity, we completed a circle map describing some of the things we could do in a popcorn blizzard. We then had a Think-Pair-Share. 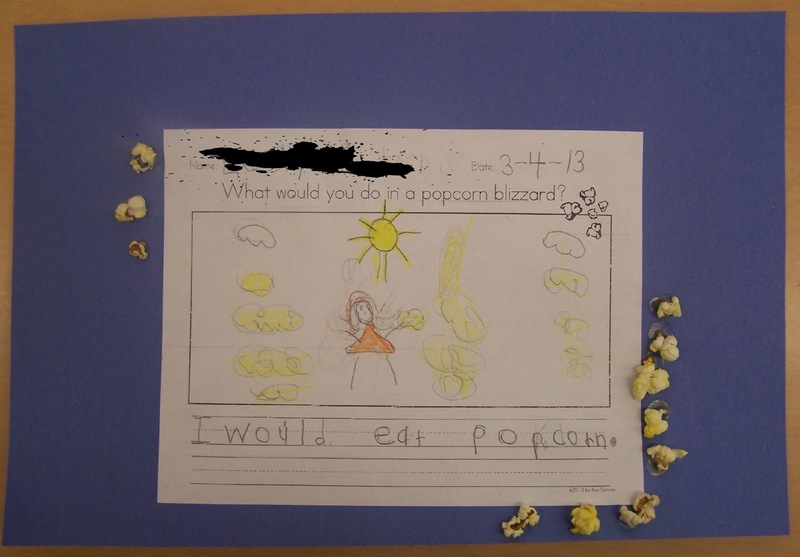 The students thought about, and then talked about what they would like to do in a popcorn blizzard. 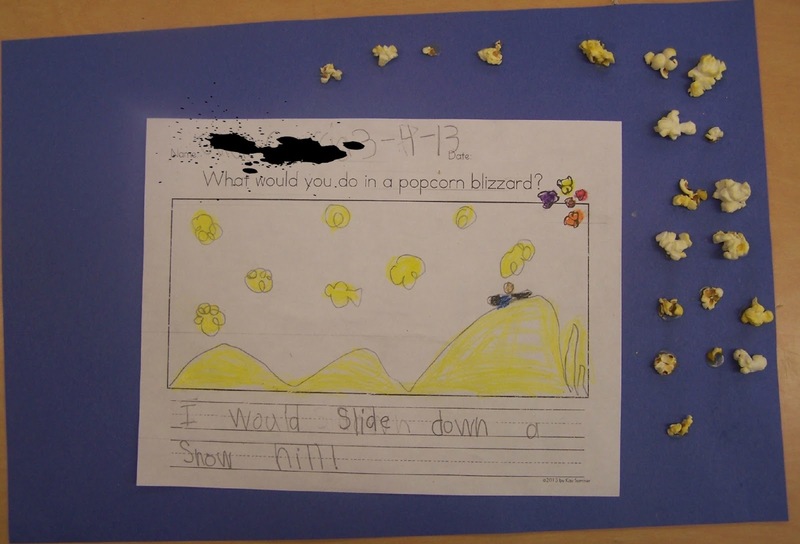 We used the sentence frame "I would..."
Then the students drew their pictures, wrote their sentences, and glued some popcorn on the paper for a real POPCORN BLIZZARD! 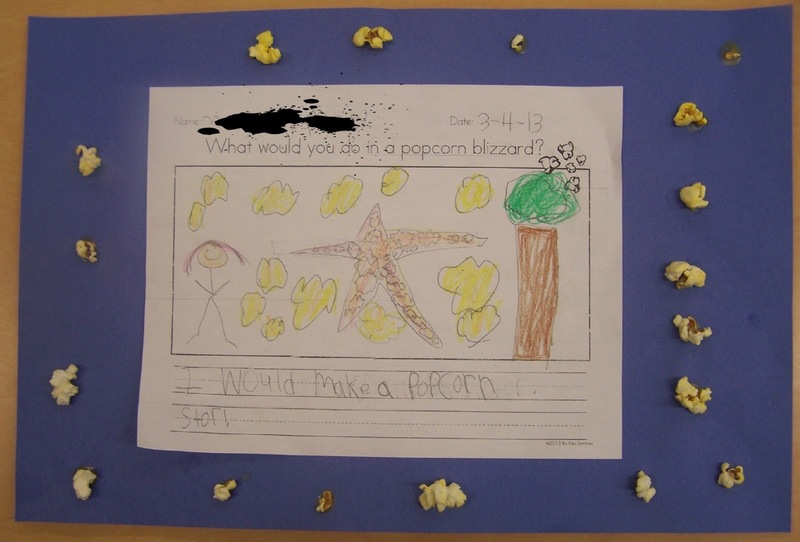 "I would make a popcorn star!" "I would make a snow angel!" "I would make a snowman!" 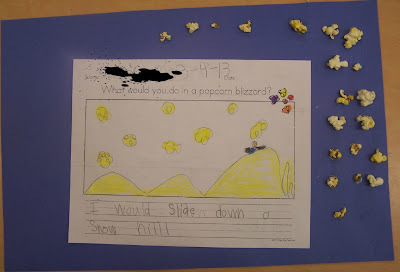 "I would slide down a snow hill!" Head over to Keeping Life Creative to read about more story-related activities, and you can link up your own activities too. It's Tell Me a Tale Tuesday!!! HI Kay! So happy to find another fellow Californian blogger who teaches kindergarten like me! I found you through the Blogs by State linky party. I am your newest follower and BTW I LOVE your popcorn blizzard idea. We moved from SoCal (OC) to the Midwest where we're having a REAL blizzard today. Yikes! I might prefer the popcorn kind... but having seasons really is growing on me. Thanks for sharing your yummy activity! My husband would totally love a popcorn blizzard! (Haha!) Fun activity! Love the popcorn blizzard! And your circle map describing what they would do during a popcorn blizzard is great. Thanks for sharing. I just found your blog from the California blogger link. I see you are so. cal. I'm a northern cal girl and your newest follower. 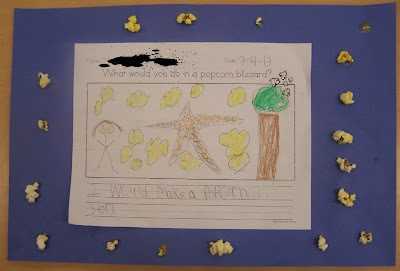 I love the popcorn blizzard, very cute! The Popcorn blizzard is such a fun idea! Thanks for sharing a fun project! I love that idea! 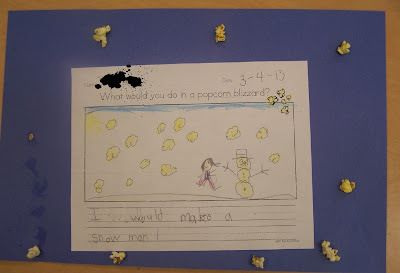 We have a popcorn unit coming up, Ithink I will be adding this activity! Thanks! !